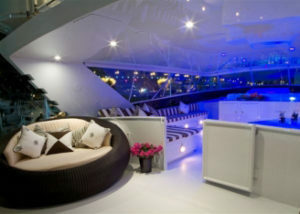 Spacious layouts, maximised for the relaxing in luxury will greet you on-board Motor Yacht Decompression. The wast aft deck features comfortable seating for your al-fresco dining; a bright and spacious lounge area; a protected flybridge with bar, internet access, BBQ and a large flat-screen TV. Decompression accommodates eight guests in four luxury staterooms, three with king size beds and one with a queen. 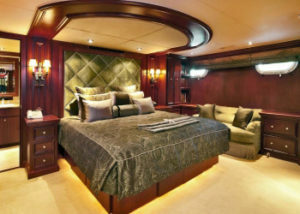 The full-width Master Stateroom has separate his & her’s bathrooms with full size Jacuzzi tub. The VIP stateroom also has his & her’s bathrooms with bath and shower. 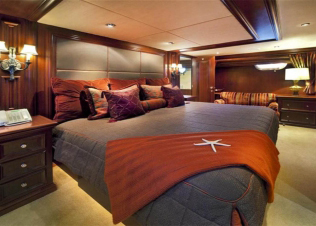 All cabins has separate climate controls, TV, and includes high-end memory foam mattresses and walk-around beds.